The 2012 season of Formula 1 has been very epic, thank you very much. Every second spent following the 16 races that have happened till now has been well spent, and has yielded good returns. The downside is, that there are only four races left, after which we shall have to bid a heartfelt good bye to what has undeniably been one of the most exciting years in Formula 1 in recent history. However, as the season drifts into its final phase and the driver's championship still seems precariously balanced on the edge of a knife, there is something that has quite taken the icing of the cake. Yes, ladies and gents, transfer season is here, and going by how things have shaped up it sure has been a shocker of sorts. This post doesn't intend to tell you what has happened. Because everybody knows what has happened, and who's gone where for the next season. This post seeks to scrape the surface of what has been some of the most unassuming transfers and intends to dig deep into why they might have happened and what it could mean to the sport in general. Without further ado, here goes. Let's face it. McLaren has, for the past few years summed up what it means to be a British dream. A thoroughbred British team with British roots, based in the heart of England. Two British drivers, both former world champions. Things really can't get more awesomely Brit, can they? But of course, every fairy tale is incomplete without the fly in the ointment and that fly for McLaren was none other than Lewis Hamilton himself. For starters, let's take a look at how Lewis has gone up the rungs of professional racing. In 1995, when he was ten years old, he met McLaren team principal, Ron Dennis and told him, "I want to race for you one day. I want to race for your team." And within three years, McLaren signed him up for their Young Driver Support Program. He won race after race in the British Formula Renault, Formula Three Euroseries, GP2 and then finally reached the pinnacle of motor sport in 2007 when he landed a multi-year contract with his dream McLaren. 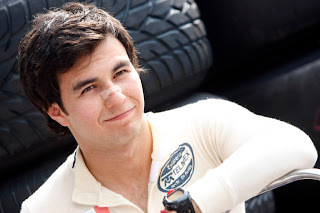 The then rookie, finished his debut F1 season 2nd, much to the amazement of thousands of fans and when in 2008, he clinched the world title he cemented his name in the hallowed records of Formula 1 as the youngest world champion in history. Come 2012, and Lewis was still going strong with McLaren and thousands of British racing fans were still living the British dream. And why not? The MP4-27 is one near perfect vehicle and is undoubtedly one of the best that this season has to offer. Every thing seemed so perfectly rosy and bright. 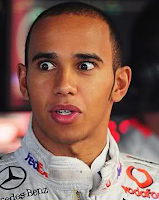 Why then, did Lewis Hamilton sign the multi-year contract with Mercedes? The answer is, that Lewis may have been the youngest world champion at some point in his life, but that does nothing to hide the fact that, essentially, basically and fundamentally, he is a douche. McLaren boss Martin Whitmarsh very clearly stated that they did everything they could to try and keep him for McLaren including a considerable fee hike. But Mercedes had a fatter wad of notes waving in their paddock and Lewis was just too smitten by the smell of crisp currency to reconsider all the British legacy that he had helped build during his five long years with the team. Oh am I disappointed? Not even one bit. I can only thank my stars that an iconic team like McLaren is finally rid of a superbly douchey driver, and that real Formula 1 fans can start supporting McLaren again. I'm just a tad bit amused at how Lewis has, by signing this multi-million pound contract, dug his own grave and hammered a nail onto his own coffin. His chances of winning another championship next season have certainly reduced by a considerable factor now, because, let's fact it: Mercedes AMG still have a long way to go before they begin constructing consistently winning machines. McLaren, on the other hand, have only mastered this art ever since they entered Formula 1 in 1966. They have 8 constructors' titles and 12 drivers' titles to vouch for all that experience and in simple terms, it would be utter tomfoolery to leave a team of this calibre for a team that is several notches below. And if one still isn't convinced about Lewis' douchebaggery, this screenshot of his twitter page will help. Read the fine fool he created of himself in his last three tweets. 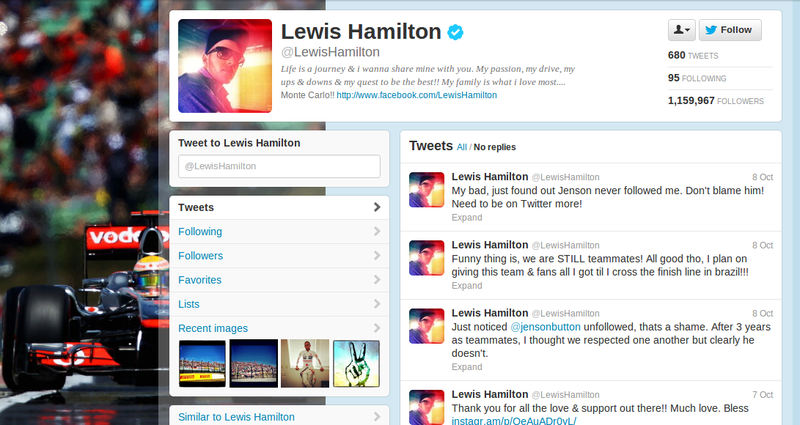 Of course, @jensonbutton being a man of some honour, chose to ignore all this drama. 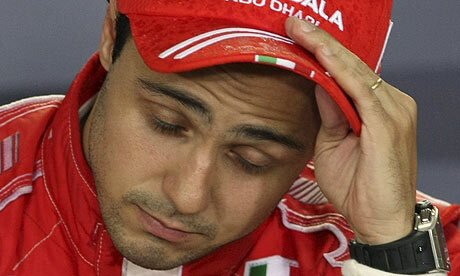 No single driver has possibly caused so much of speculation throughout a season of Formula 1 as Felipe Massa here, has. I don't blame him. The chap is good. Has a heart of gold. And is as obedient a racing driver as one can be. He's happy playing second fiddle to Alonso and he is only too gracious with Ferrari for letting him stay on far beyond his prime days. I just don't get it. How do I drive faster? But contracts end, whether you have a heart of gold or not, and the expiry of Ferrari's contract with Massa meant that he had to find a team for 2013. Going by his below-sluggish performance through most of 2012, wherein he managed to widen he gap between himself and team mate Alonso by over 200 points, did indeed sow seeds of doubt in Ferrari's paddock. Oh wait, seeds of doubt had always been there - what 2012 did was water all those flower beds and give rise to fine young plants with big question marks hanging from every branch. Till a month earlier, it seemed very unlikely that Ferrari would extend the contract. A team that boasts of racing genes like none other in the history of motor sports, with a galactic track record to boot, simply cannot make do with a driver who after 16 races into a season is dangling along at 9th place in the driver's championship tally - that too, after having scored most of the points only in the previous two races. With Massa almost certainly ruled out for Ferrari in 2013, a lot of people racked their brains on who his replacement could be. Would it be Sergio Perez? Or impossible as it might sound, was there any chance that Michael Schumacher (whose contract with Mercedes ends this year) himself would be brought back into the same cockpit in the hope that history would be created again? Clearly, the second option was just too out-of-this-world to happen for real. Schumacher in Ferrari would mean he had to play ball-boy to Fernando Alonso, which is a level too low for the seven time world champion to stoop down too. 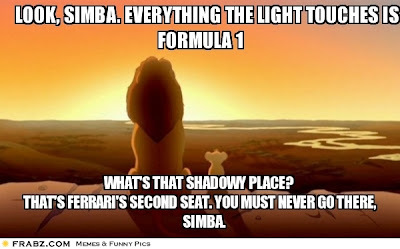 And Ferrari wouldn't have survived such a season anyways. So the only option was Sergio Perez, was it? Surprises abound, Ferrari decided to keep Massa instead. In what was clearly some of the most fake tweets that the Twitterverse has ever seen , @InsideFerrari tweeted that they are only too glad to extend the contract for another year, while @alo_official was of the opinion that he loves to be in the same team as @Felipe1Massa and he cannot wait for the next season to begin. @InsideFerrari : Yeah, we need someone to stand in as second a driver for 2013. We have no other option. Sebastian Vettel's contract with Red Bull expires in 2013. We are eyeing him for 2014. Till then, Massa can trudge along. @alo_official : I love being in the same team as @Felipe1Massa. Isn't it awesome how @InsideFerrari always favours me? And how no one gives a **** about what he's up to? Tee hee hee. Sounds legit, indeed. Think about it. This meme would help clear stuff. 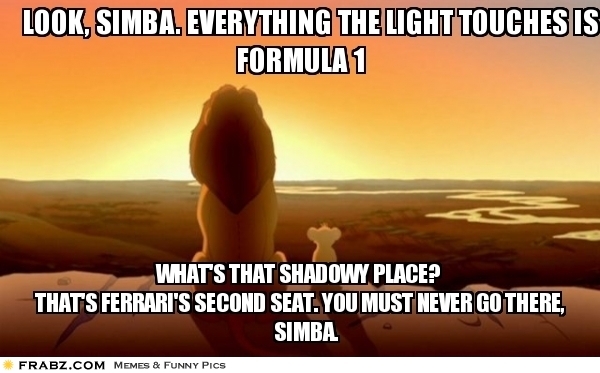 Too bad Massa's the one stuck in the shadowy region you see there. On a related note, I wonder how Ferrari will cope with Vettel and Alonso in the same team for 2014. Who'll be the first driver? Who'll be second? Will one of them agree to succumb to team orders in favour of the other? Let's just hope that they don't implode because of that. Thumbs up, I say. The Mexican has shown enormous talent and pace this season with Sauber, and he seems like just the sort who would complement former world champion Jenson Button and take McLaren ahead in the process. I sense a potential constructors' champion for 2013 here, and now that Lewis is gone, I wouldn't mind supporting McLaren again. 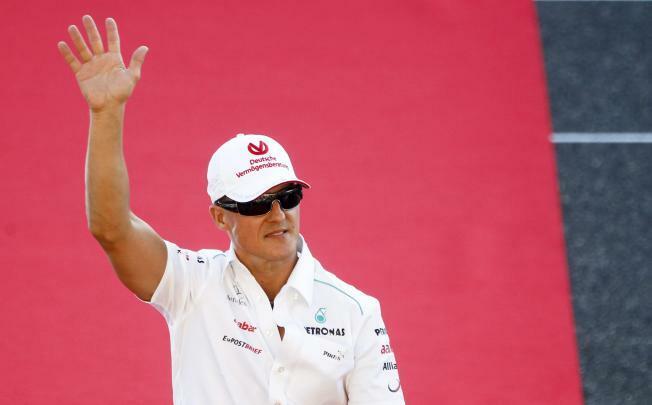 Hamilton moving to Mercedes meant either Rosberg or Schumi had to call it a day. And Rosberg is young, and has a long and potentially brilliant career lined up ahead. Which means, we must, for the second time now, bid a fond good bye to the maestro Michael Schumacher. It's been a career of sorts, reaching zeniths unimaginable in sporting history. His return with Mercedes wasn't all that good and a dismal 2012 means, he shouldn't really be trying his luck anymore. He's old, and choosing to retire has been a good decision indeed. Let's just hope we get to see him atop the podium once as his career speeds into the setting sun with just four races remaining this year. Quite a swansong it would be, if that happens. That's that, then. Mind you, A lot of other transfers have happened. Several interesting swaps have happened in the mid field with Force India, Sauber and Williams. But well, the big ones. Were these. Let me know what you think in comments.